Related in our newspaper in the 80th driving the Scora.Charly Carcreff, with Christophe Lottin, is coming back with the new car LC01.Still prototype,this product suitable for anybody is coming next year. 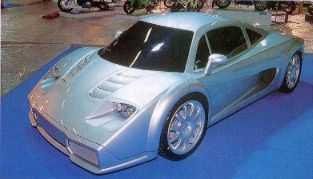 This car is one of the smallest supercar in the world (compact, light and quick moving) It'll be available with three different engines: four cylinders 2.0l atmospheric (167 hp) with a 6 gears gearbox; six cylinders atmospheric (210hp) with a 5 gears gearbox or turbo-engine (300hp) with a sequential 6 gears gearbox. With a weight less than 900 kilos, the rate weight/power of this high-powered car is 3.3 kilos/hp.